Corals are a group of small, tropical marine animals that attach themselves to the seabed and form extensive reefs, commonly in shallow, warm-water seas. These reefs are made up of the calcium-carbonate (limestone) skeletons of dead coral animals. Coral reefs form the basis of complex marine food webs that are richer in species than any other ecosystem (community of plants and animals). A coral, or polyp, lives inside a cup-shaped skeleton that it secretes around itself. Resembling a sea anemone, a coral is a jelly-like sac attached at one end in its skeleton. The open end, the mouth, is fringed with stinging tentacles. A coral feeds by sweeping the water with its tentacles and stunning microscopic prey, which it then draws inside itself. Individual corals that gather together in large colonies are usually under one-eighth inch (3 millimeters) long. 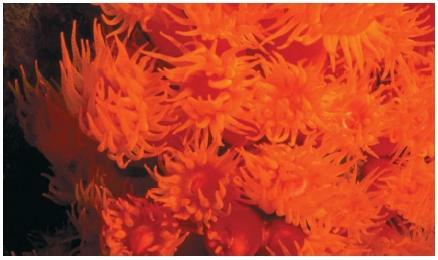 Living corals are often beautifully colored. Corals reproduce two ways. Fertilized eggs released by the corals hatch to form larvae. After settling on a suitable surface, the larvae secretes its own limestone cup and grows into a mature coral, thus beginning a new colony. Corals also reproduce by budding, or forming new corals attached to themselves by thin sheets of tissue and skeletal material. In this way, corals grow into large, treelike structures. Coral reefs are formed mainly by the hard skeletons of corals and the limestone deposits of coralline algae and other marine animals. Reefs grow upward as generations of corals produce limestone skeletons, die, and become the base for a new generation. Coral reefs lie in a zone of water 30°N to 30°S of the equator. Reef-forming coral animals flourish only in water under 100 feet (30 meters) deep and warmer than 72°F (22°C). Coral reefs are classified into three main types. Fringing reefs grow close to the shore of a landmass, extending out like a submerged platform. Barrier reefs also follow a coastline, but are separated from it by wide expanses of water. 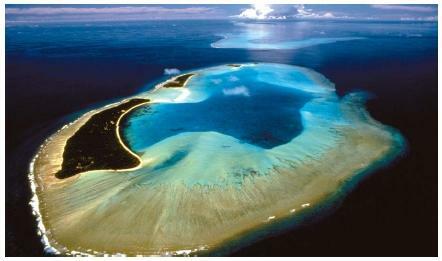 Atolls are ring-shaped reefs surrounding lagoons. wide and about 1,250 miles (2,010 kilometers) long, and is separated from the shore by a lagoon 10 to 150 miles (16 to 240 kilometers) wide. With it numerous crevices and crannies, a coral reef is a home and feeding ground for countless numbers of fascinating marine life-forms. No ecosystem on Earth plays host to the diversity of inhabitants as found in and around a coral reef. Except for mammals and insects, almost every major group of animals is represented. More than 200 coral species alone are found in the Great Barrier Reef. Monitoring Network, an international environmental monitoring organization, issued the report with data gathered from scientists around the globe. According to the report, the world has lost 27 percent of its coral reefs. Some of those reefs can never be recovered, while some could possibly come back. Most of the damaged reefs were found in the Persian Gulf, the Indian Ocean, the waters around Southeast and East Asia, and the Caribbean and adjacent Atlantic. The report pointed out that global warming was the biggest threat facing coral reefs, followed by water pollution, sediment from coastal development, and destructive fishing techniques (such as using dynamite and cyanide). If nothing is done to stop the destruction caused by humans, 60 percent of the world's coral reefs will disappear by 2030.